In hindsight, taking a group of people currently resident in Florence to an Italian restaurant in Oxford probably wasn't my most inspired idea. We Brits may have taken Italian cuisine to our hearts and annexed its deliciousness, treasuring it almost as much as a Sunday roast, but that doesn't necessarily mean that our offerings will compare with Tuscan fare. In this tale, they certainly don't. The evening didn't start well. That's a lie: it started far too well. One happy hour cocktail in the Duke of Cambridge led to another and soon my protesting stomach was warning me that it was already 7.30pm. Our original desitination, Branca, was packed, so we tried our luck at Walton Street's other Italian, Mamma Mia. The second branch of the popular Summertown pizzeria, this welcoming spot has been open a couple of years. It's smart and inviting, with cheery decor and friendly staff. If you're in the mood for pasta or pizza, Mamma Mia is the place to be. If you're not feeling the 'Italian foodsuffs beginning with p' vibe, you'd do well to give it a miss. 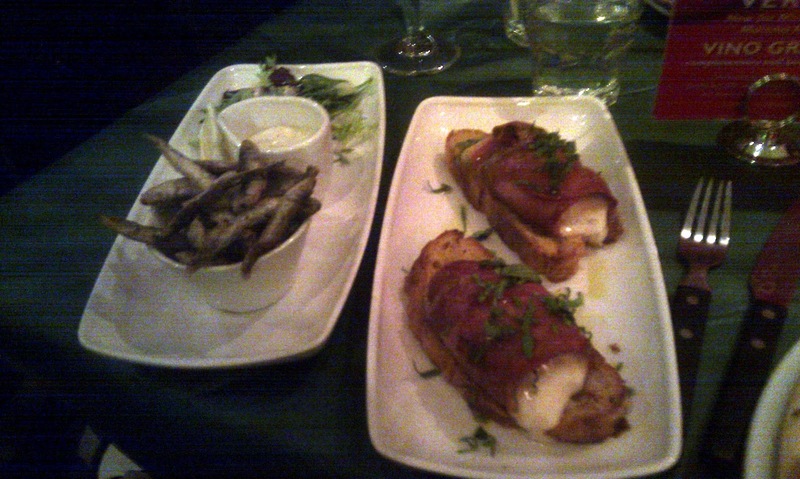 Although the antipasti are traditionally Italian, in the rustic 'what nonna used to make' vein, the rest of the menu is limited to wheaty treats and salad. The antipasti are worth more than a glance: simple, rustic-sounding starters including baked goat's cheese with fresh tomatoes on ciabatta come in at around £4.95. If you want a double dose of wheat (or have a small appetite), you can also opt for a starter-size pasta portion. The rest of the menu is reasonably priced, with a decent selection of pasta and pizza options from the standard (margherita, £6.75 and spaghetti puttanesca, £8.55) to the more interesting (goat's cheese, spinach and red onion pizza, £8.55, or rigatoni with smoked salmon in a cream and dill sauce, £8.95). If you fancy a bit more of grandma's traditional cooking though, you won't find it on Mamma Mia's menu. The Italian contingent (who were actually Brazilian, English and French, but let's not complicate an already tricky situation) didn't have much appetite after their lunchtime fish and chip feast, so they opted for antipasti or to share plates of pizza. Y's baked goat's cheese on toast went down a treat, while N and D enjoyed their baked mozzarella wrapped in aubergine and parma ham (£5.95), praising its creamy texture and combination of flavours. The whitebait (£4.95) was described as 'decent', but their Mediterranean pizza (topped with smoked chicken, chorizo, red onion and capers, £8.95) didn't receive many compliments. The base was a little underdone, the crust far from crispy (as the Florence-dwellers have come to expect) - this surprised me, as I remembered the pizza at Mamma Mia's South Parade branch being excellent. 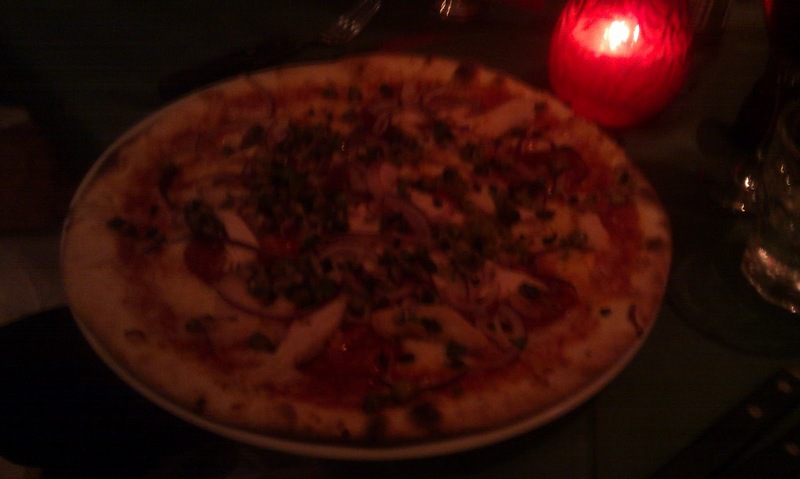 The Brazilians were similarly underwhelmed with their pizza. The pasta was better received: both A and I had linguine gamberoni, with tiger prawns, cherry tomatoes, chilli and rocket (£9.95), which was served in a generous portion. 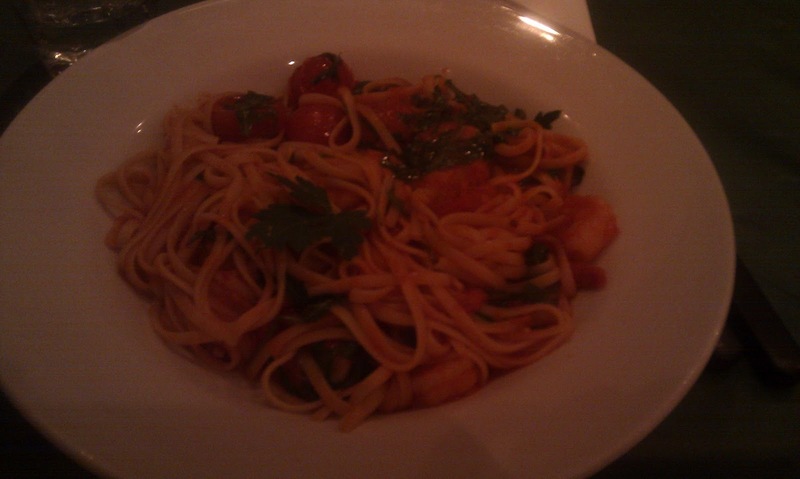 I was surpised to find that it came in a tomato sauce: I'd been expecting plain pasta mixed with the ingredients. The sauce was rich and tasty though, so I wasn't complaining. Even without the added complication of raised expectations on the part of my fellow diners, Mamma Mia failed to shine. Keeping its menu simple and sticking to a small repetoire of dishes should help the chefs to excel in what they produce, but sadly we felt that our meals were fairly average. My pasta was enjoyable enough but not outstanding, while the pizza was disappointing compared to other offerings in Oxford. It's a shame, as the restaurant itself is atmospheric and inviting, and the staff friendly and helpful. But next time I'm craving Italian foodstuffs beginning with 'p', I'll probably head East to La Cucina or Mario's instead. Mamma Mia is at 102 Walton Street, OX2 6EB and 8 South Parade, OX2 7JL. Tel: 01865 311211 (Jericho) or 01865 514141 (Summertown).